Valentine’s Day is right around the corner. If you are just moving into a Primal lifestyle, or you just transitioning to eating unprocessed foods, Primal friendly Valentine’s Day treats can be tough to navigate. You can find thousands of options on Pinterest, but with many requiring a long list of expensive ingredients, it can be overwhelming to plan your menu. Since Valentine’s Day basically equals chocolate, it can be hard to avoid all of the sugar filled, store bought treats. For us, the junk found in the store can leave us feeling less than awesome. So, to help you out, we have gathered up a few “no fail” desserts that we make for the holidays. 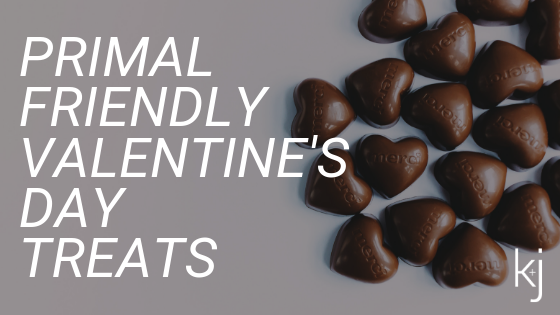 Today, I’m sharing our favorite Primal friendly Valentine’s Day treats to help you stay away from the traditional treats. The chocolate molten lava cakes from Clean Eating with a Dirty Mind are amazing. These little bites of deliciousness look as good as they taste. Personally, anything made in a ramekin seems automatically better since I get to dig into my own personal dish. The chocolate chips I prefer in these cakes are from Enjoy Life. The Clean Eating with a Dirty Mind cookbook is actually my go-to cookbook for Paleo and Primal friendly desserts. The better than box brownies are the best brownies I’ve ever had, so if you have the book, make them. One trick I use with the brownies is under bake them just a touch and then store them in the fridge. Holy fudge. Can you really go wrong with a treat made from almond butter? Not in my house. I don’t know that I can even count the number of times I’ve made these almond butter blondies from PaleOMG. They are popular at any get together, and if they are in the house, they are really hard for me to resist. These blondies are sweet, moist, and are pretty much a perfect Primal friendly Valentine’s Day treat. However, watch the almond butter. Many are loaded with added sugar and oils. My favorite almond butter is actually the Members Mark brand from Sam’s. It’s made with just almonds and salt, and you get a 24 oz jar for right around $10. To me, truffles scream Valentine’s Day. These chocolate truffles from Nom Nom Paleo will not disappoint. They are beautiful, and they taste amazing. Note that these truffles do need a little time to hang out in the fridge, so make sure you plan for that. If you like more of a nougat filled truffle, check out these dark chocolate strawberry cashew truffles from Paleo Running Momma. I love brownies. I wish I didn’t love them so much, but I do, so I had to include a link to a good one. These coconut flour brownies from Texanerin Baking are really yummy. Plus, the addition of frosting makes them extra special. I would include some sliced strawberries on top. I mean, chocolate and strawberries are pretty much the best match in the world, so I think the strawberries take these brownies to another level. Since we do include dairy in our diet, I use milk instead of almond milk in this recipe. I hope one of the four Primal friendly Valentine’s Day treats I’ve listed looks good to you. These are all pretty easy to make, and I promise, they taste really, really good. Remember that these are all treats, and while they are better than flour and sugar filled options, these should not be a regular addition to your diet. Maybe you don’t feel like baking. If not, I would highly recommend a little dark chocolate taste test for Valentine’s Day. It’s fun, and who doesn’t love chocolate? Grab your favorite bottle of red wine, and start tasting. Here’s how we did our taste test. Even if you’re not a huge Valentine’s Day fan, I hope you enjoy time with your loved one and use this day to let him or her know how awesome he or she is. We personally don’t do a huge Valentine’s Day celebration, but you better believe I’ll be making a treat, and I’ll make an intentional effort to let Josh know how much I appreciate him.